Names are the double-edged sword when plotting a story. They can act as servants to the narrative or, sometimes, they can be the cause of hijackings and anarchy. I suppose that last statement requires a bit of clarification. Usually, when plotting a story, a character has a clearly defined role and purpose within the narrative. A brutish thug will often command a suitably simple and harsh name. Bruno or Mord are good names for hatchetmen and bullies. A more sophisticated character will adopt a more sophisticated name, Jeremias or Iskander are the sort of titles one might bestow on a nobleman or philosopher. The name feeds into the character, becomes a part of his already clearly-defined role within the story. The more defined the character already is, the more likely it is that the right name will attach itself to him. Some part of the author’s brain simply knows when that name has been found. The clearest example of this in my experience was when I started work on the Brunner stories for Inferno! magazine. The character of Brunner, this amoral, coldly professional bounty killer operating in Warhammer’s grim Old World, was already very well defined. Indeed, I’d already written much of the first story featuring him before he acquired his name. In that first draft, he was ‘Kolb’, in an earlier outline he was ‘Rasche’. Neither name felt right and my editor Marc Gascoigne suggested the name ‘Brunner’. As soon as that suggestion was made, I knew it was the right name. It had the right tone of harshness to it, a bit of sinister underpinning that lent itself to the vicious character it would be attached to. In Brunner’s case, the character sought out the name. Sometimes, and especially with supporting characters, the name will act in reverse. The name picked out will define the character, sometimes to a degree where they become almost unrecognizable from the original depicted in the outline. The name might conjure up certain actions or twists of personality, declare peculiarities of morality or mentality. That simple thug in the outline might evolve into a giggling sadist because the name he’s acquired calls up a mental picture of Peter Lorre or Strother Martin. The beautiful princess might find herself evolving into a shrewd schemer because her name suggests Ingrid Pitt or Luciana Paluzzi in the ‘role’. Needless to say, such evolutions of character based upon the name and the mental associations it evokes can have a serious effect on the plot. Going back to Brunner for a moment, in the story ‘Deathmark’, a Tilean necromancer makes his debut. Trying to find a sinister-sounding Italian moniker to grace this villainous personage, I decided upon ‘Carandini’, connected to Sir Christopher Lee’s noble Italian pedigree. Oddly, the character began to change after gaining this name. By the time I was half-way through the story I found that Carandini had acquired all sorts of odd habits – he was messy, conniving and, strangely, both arrogant and cowardly. I realised I was writing him as though he was being portrayed by Brad Douriff, an actor who of course played Grima Wormtongue opposite Christopher Lee’s Saruman in The Lord of the Rings. It really seemed to work for the character and made him so memorable that I resurrected him when writing the Mathias Thulmann novels. The little habits and quirks picturing Douriff in the ‘role’ added so much meat to the part of Carandini that it felt like a waste to let him rest in his untimely grave. There have been times, too, when you have a name – or an idea for a name – and no character to attach it too. This is how odd little details and interludes can crop up in stories. 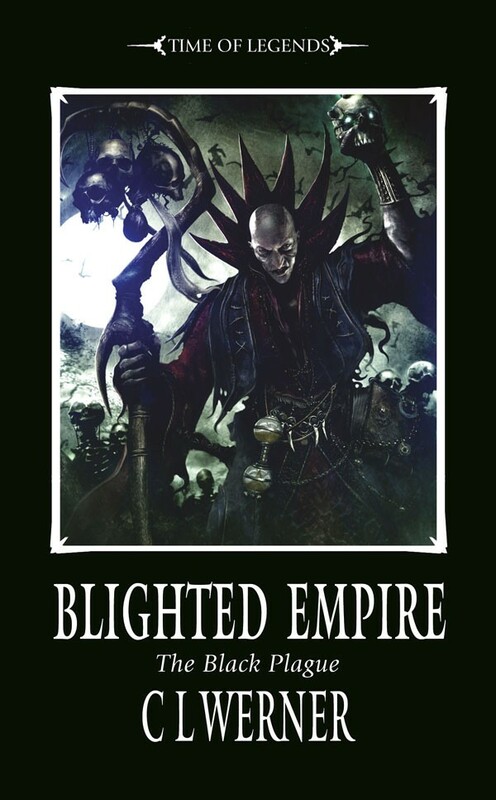 Finding a clever way to contort the owner of this blog’s name into that of a skaven assassin suggested an entire scene in Blighted Empire, producing a conflict between Abingnaw-hakk against one of the principle characters of that novel that wasn’t in the original outline. There have been other instances as well. Despite the obvious imagery of real Witch-hunter General Matthew Hopkins, the character of Mathias Thulmann was named for my best friend in high school, Matthew Box, though at the time I wasn’t certain if Mathias would be the witch hunter or the paranoid cultist he ended up fighting against! Names. If you aren’t careful they can take you places you never intended to go. C. L. Werner on the Web. The next guest on the blog is author James Maxey, and his post will be up this Thursday on the 23rd. You can find the full schedule in the link up top. Posted on May 20, 2013, in Debut Authors Guest Series, Guest Posts and tagged Black Library, Blighted Empire, Blood for the Blood God, C. L. Werner, Dead Winter, Debut Authors Guest Series, Fantasy, Guest Posts, Names, Names A New Perspective, Rogue Blades Entertainment, Siege of Castellax, The meaning of Names, Warhammer, Warhammer 40000, Writing Fantasy Heroes. Bookmark the permalink. 3 Comments. The latest in Ab’s brilliant series bringing a multitude of sci-fi and fantasy authors together to give their theories on naming conventions and other related giblets.